Once again, I find myself at a loss for words. I sit in front of the computer, unable to move forward with any discernible thoughts. It’s not as if I have writer’s block. It’s worse. I can’t explain why I’ve lost my ability to create. My brain begs to differ. All inside of my head there’s a rambling of ideas and plot lines. As I work, I resolve my characters head-hopping ways and force them to tell a story from only one side’s perspective. I’ve figured out how to end that book of mine so that any reader will gasp and say, “OMG! WTF! !” But when I actually open the files and attempt to take on the edits I need to do so I can once and for all submit the book to my agent…no words come calling. My spirit isn’t up to the task. I can’t even manage to keep up this blog, which I used to write twice a week. Now if I manage two entries a month, it’s an achievement. You see, I’ve had some significant life changes. The loss of both my parents, my marriage and my career in an 18-month span all added up. Writing lessened the sting. This blog, plus my book, kept me going during the darkest hours. I have a friend who lost his father in a tragic accident and his balm for dealing with his unbearable pain was writing. He encouraged me to keep at it. I did, and it helped. Some of my best stuff happened after pushing back tears and willing myself to concentrate. Use that emotion somewhere, I thought, and as I dug down, I felt the sharp sting my characters faced during a conflict. And as my sister will tell you, that’s where and when my best writing occurred. Then something odd happened when I moved out of my former home to a new town and began a solo life once more: much as I wanted to, I couldn’t write. Anything. For fifteen years I lived in a house with my husband and son. Our lives revolved around each other, no matter how awful things turned, and while things grew odd and often painful, that house still was my home. Then I moved out and lived alone. That didn’t bother or frighten me, it’s just how my life panned out and I accepted it. As mentioned in my last blog, I pulled out my computer and resolved to write again. As much as I’d will myself to, those damn words refused to cooperate. There’s only so long one can stare at a screen and not get bug-eyed, especially if there’s no reward for the effort. So I’d give up and feel worse than before. 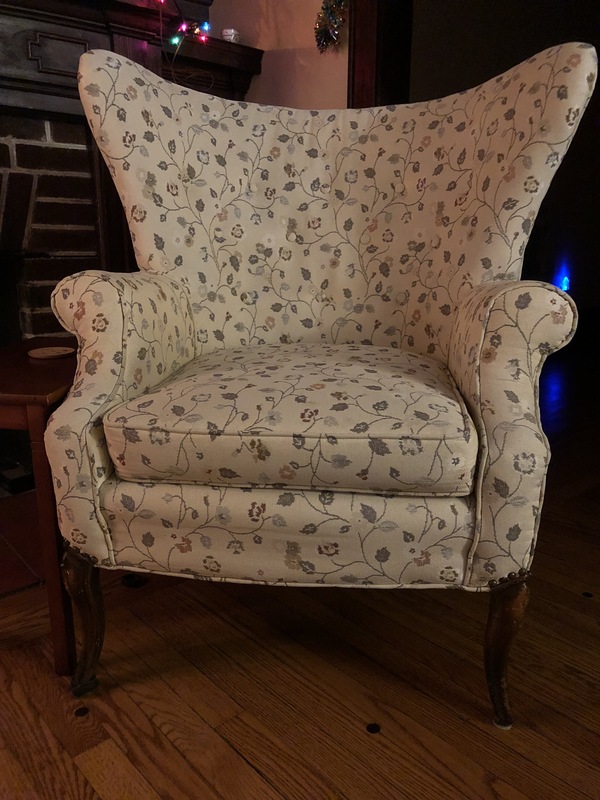 One afternoon, having the day off from the retail job I took to survive, I regarded a chair from my mother’s former bedroom. She’d had it reupholstered in ecru, with a delicate floral pattern tangled in the weave. Mom set it in the corner next to her dresser. She never sat in it. As she approached the end of her run, that chair provided an excellent substitute for her closet. The same shirts and pants she wore day in and out rested on its back and seat. Now it sits in my living room next to the fireplace. I ran my hand across the top, smiled and thought of her. I sat down in it, leaned back and stared out at nothing in particular. My mind emptied. And there I remained, for over an hour, paralyzed. When I finally snapped out of it, I grew frightened. What’s happening to me? I thought. A tsunami overwhelmed my brain. All that I’d been through, all the loss, the pain, the hurt, betrayal, all of it, consumed me. I gasped for air, sobbing, still in that chair. Is Mom in this chair with me? Is she making me feel this way? Am I cracking up? How did I get like this? What’s wrong with me? See, I’d been muddling through for so long I’ve never had much opportunity for grieving over all I’ve lost. But in that moment in a chair that never had much use, it handed me a big dose of pain. The tears dried up, as they will, only to be replaced by numbness I’d never felt before. My eyes closed. Sank my head in my hands. Felt my heart race and ring in my ears. And again, yet another hour drifted passed, without notice. Finally, I pulled myself up and out of the chair. This is no way to be. The sun shone through the venetian blinds. A thick carpet of leaves swirled in the breeze on my lawn. A noisy truck roared down the main street. Dogs barked. Life continued in my new hometown, unafraid, normal, as it should be. I glanced out the window and noticed the ruddy shade of the mountains that ring the town. It’d grown late in the day and sunset approached. I could have written this afternoon…why didn’t I? I’ve beaten myself up too much as of late. That book of mine will be completed. Soon. But I’ve got to reclaim my ability first. And rather than overwhelm myself with what I need to do, I convinced myself I’ll start small, a little bit each day, and write anything, even if it’s once sentence. I can tweet, I can comment on Facebook, I can keep a blog. It’s writing. It’s a start. « Moving + Writing = AAAAAAUUGHH!